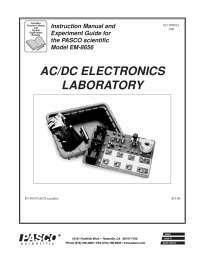 Lab manual for ac-dc electronics. 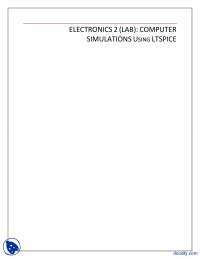 The PASCO scientific Model EM-8656 AC/DC Electron- ics Laboratory manual is copyrighted and all rights reserved. However, permission is granted to non-profit educational institutions for reproduction of any part of this manual providing the reproductions are used only for their laboratories and are not sold for profit. Reproduc- tion under any other circumstances, without the written consent of PASCO scientific, is prohibited. PASCO scientific warrants this product to be free from defects in materials and workmanship for a period of one year from the date of shipment to the customer. PASCO will repair or replace, at its option, any part of the product which is deemed to be defective in material or workman- ship. This warranty does not cover damage to the product caused by abuse or improper use. Determination of whether a product failure is the result of a manufacturing defect or improper use by the customer shall be made solely by PASCO scientific. Responsibility for the return of equipment for warranty repair belongs to the customer. Equipment must be properly packed to prevent damage and shipped postage or freight prepaid. (Damage caused by improper packing of the equipment for return ship- ment will not be covered by the warranty.) Shipping costs for returning the equipment, after repair, will be paid by PASCO scientific. Please—Feel free to duplicate this manual subject to the copyright restrictions below. Should the product have to be returned to PASCO scientific for any reason, notify PASCO scientific by letter, phone, or fax BEFORE returning the product. Upon notification, the return authorization and shipping instructions will be promptly issued. ➀ The packing carton must be strong enough for the item shipped. ➁ Make certain there are at least two inches of packing material between any point on the apparatus and the inside walls of the carton. ➂ Make certain that the packing material cannot shift in the box or become compressed, allowing the instrument come in contact with the packing carton. ä NOTE: NO EQUIPMENT WILL BE ACCEPTED FOR RETURN WITHOUT AN AUTHORIZATION FROM PASCO. The EM-8656 AC/DC Electronics Laboratory is designed for both DC and AC electricity experiments. The circuit board can be powered by batteries for DC experiments or it can be powered by a computer equipped with a Power Amplifier for AC experiments. The AC experiments could also be performed without a Power Amplifier if a function generator is available. The first ten experiments in this manual are DC experi- ments using battery power and multimeters rather than using a computer. The rest of the experiments use a computer (MAC or PC) with a Power Amplifier. The software used is Science Workshop™. * NOTE: Due to manufacturer's tolerances, wattage may vary by 15-30% from bulb to bulb. ➀ Store the components in the Ziplock bag until needed. Keep track of, and return the components to the Ziplock bag after the experiment is completed. ➁ Identify the resistor value required for the individual experiments with the help of the following chart. ➂ Familiarize yourself with the board layout, as shown. ➃ Students will need to use the same component layout from one experiment to another. Labeling of the boards and your meters will enable students to more easily have continuity in their work. Using removable labels or using a permanent marker are two alterna- tives for marking the board. The springs are securely soldered to the board and serve as a convenient method for connecting wires, resistors and other components. Some of the springs are con- nected electrically to devices like the potentiometer and the D-cells. In the large Experimental Area, the springs are connected in pairs, oriented perpendicular to each other. This facilitates the connection of various types of circuits. If a spring is too loose, press the coils together firmly to tighten it up. The coils of the spring should not be too tight, as this will lead to bending and/or breaking of the component leads when they are inserted or removed. If a spring gets pushed over, light pressure will get it straight- ened back up. The components, primarily resistors, and small wires can be stored in the plastic bag supplied in the storage case. Encourage students to keep careful track of the compo- nents and return them to the bag each day following the lab period. When connecting a circuit to a D-cell, note the polarity (+ or -) which is printed on the board. In some cases the polarity is not important, but in some it will be impera- tive. Polarity is very important for most meters. Connections are made on the Circuits Experiment Board by pushing a stripped wire or a lead to a component into a spring. For maximum effect, the stripped part of the wire should extend so that it passes completely across the spring, making contact with the spring at four points. This produces the most secure electrical and mechanical connection. Additional Equipment needed: Please refer to the Equipment Needed section in the beginning of each experiment for a listing of all equip- ment requirements. 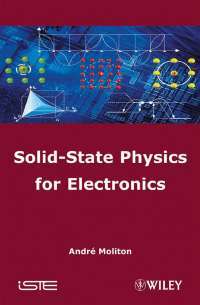 The experiments written up in this manual are develop- mental, starting from an introduction to the Circuits Experiment Board and complete circuits, through series and parallel circuits, ultimately resulting in diode and transistor characteristics. These experiments can be used in combination with existing labs that the teacher em- ploys, or may be used as a complete lab unit. VOM: The Volt-Ohm-Meter or VOM is a multiple scale, multiple function meter (such as the PASCO SB-9623 Analog Multimeter), typically measuring voltage and resistance, and often current, too. These usually have a meter move- ment, and may select different functions and scales by means of a rotating switch on the front of the unit. Advantages: VOM’s may exist in your laboratory and thus be readily accessible. A single meter may be used to make a variety of measurements rather than needing several meters. Disadvantages: VOM’s may be difficult for beginning students to learn to read, having multiple scales corre- sponding to different settings. VOM’s are powered by batteries for their resistance function, and thus must be checked to insure the batteries are working well. Typi- cally, VOM’s may have input resistances of 30,000 Ω on the lowest voltage range, the range that is most often used in these experiments. For resistances in excess of 1,000 Ω, this low meter resistance affects circuit opera- tion during the taking of readings, and thus is not usable for the capacitor, diode and transistor labs. DMM: The Digital Multimeter or DMM is a multiple scale, multiple function meter (such as the PASCO SB-9624 Basic Digital Multimeter or the SE-9589 General Purpose DMM), typically measuring voltage and resistance, and often current, too. These have a digital readout, often with an LCD (Liquid Crystal Display). Different func- tions and scales are selected with either a rotating switch or with a series of pushbutton switches. Advantages: DMM’s are easily read, and with their typically high input impedances (>106 Ω) give good results for circuits having high resistance. Students learn to read DMM’s quickly and make fewer errors reading values. Reasonable quality DMM’s can be purchased for $60 or less. PASCO strongly recommends the use of DMM’s. Disadvantages: DMM’s also require the use of a battery, although the lifetime of an alkaline battery in a DMM is quite long. The battery is used on all scales and func- tions. Most DMM’s give the maximum reading on the selector (i.e., under voltage, “2” means 2-volt maximum, actually 1.99 volt maximum). This may be confusing to some students. The Vacuum Tube Voltmeter or VTVM is a multiple scale, multiple function meter, typically measuring voltage and resistance. They do not usually measure current. The meter is an analog one, with a variety of scales, selected with a rotating switch on the front of the meter. Advantages: VTVM’s have high input resistances, on the order of 106 Ω or greater. By measuring the voltage across a known resistance, current can be measured with a VTVM. Disadvantages: VTVM’s have multiple scales. Students need practice to avoid the mistake of reading the incorrect one. An internal battery provides the current for measur- ing resistance, and needs to be replaced from time to time. Grounding problems can occur when using more than one VTVM to make multiple measurements in the same circuit. Individual meters, frequently obtained from scientific supply houses, are available in the form of voltmeters, ammeters, and galvanometers (such as PASCO’s SE-9748 Voltmeter 5 V, 15 V , SE-9746 Ammeter 1 A, 5 A and SE-9749 Galvanometer ± 35 mV). In some models, multiple scales are also available. Advantages: Meters can be used which have the specific range required in a specific experiment. This helps to overcome student errors in reading. Disadvantages: Using individual meters leads to errors in choosing the correct one. With limited ranges, students may find themselves needing to use another range and not have a meter of that range available. Many of the individual meters have low input impedances (voltmeters) and large internal resistances (ammeters). Ohmmeters are almost nonexistent in individual form. The #14 bulbs are nominally rated at 2.5 V and 0.3 A. However, due to relatively large variations allowed by the manufacturer, the wattage of the bulbs may vary by 15 to 30%. Therefore, supposedly “identical” bulbs may not shine with equal brightness in simple circuits. The purpose of this lab is to become familiar with the Circuits Experiment Board, to learn how to construct a complete electrical circuit, and to learn how to represent electrical circuits with circuit diagrams. ➀ Many of the key elements of electrical circuits have been reduced to symbol form. Each symbol represents an element of the device’s operation, and may have some historical significance. In this lab and the ones which follow, we will use symbols frequently, and it is necessary you learn several of those symbols. ➁ The Circuits Experiment Board has been designed to conduct a wide variety of experiments easily and quickly. A labeled pictorial diagram of the Experiment Board appears on page 2. 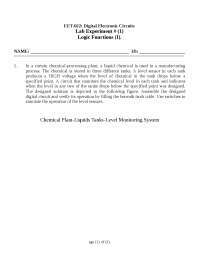 Refer to that page whenever you fail to understand a direction which mentions a device on the board itself. a) The springs are soldered to the board to serve as convenient places for connecting wires, resistors and other components. Some of the springs are connected electrically to devices like the potentiometer and the D-cells. b) If a spring is too loose, press the coils together firmly to enable it to hold a wire more tightly. If a spring gets pushed over, light pressure will get it straightened back up. If you find a spring which doesn’t work well for you, please notify your instructor. c) The components, primarily resistors, are contained in a plastic case at the top of the board. Keep careful track of the components and return them to the storage bag following each lab period. This way you will get components with consistent values from lab to lab. d) When you connect a circuit to a D-cell (each “battery” is just a cell, with two or more cells comprising a battery) note the polarity (+ or -) which is printed on the board. Although in some cases the polarity may not be important, in others it may very important. e) Due to normal differences between light bulbs, the brightness of “identical” bulbs may vary substantially. ➀ Use two pieces of wire to make connections between the springs on one of the light bulbs to the springs on the D-cell in such a way that the light will glow. Discuss with your lab partner before you begin actually wiring your circuit which connections you intend to make, and why you think you will be successful in activating the light. If you are not successful, try in order: changing the wiring, using another light, using another cell, asking the instructor for assis- tance. a) Sketch the connections that the wires make when you are successful, using the symbols from the first page of this lab. b) Re-sketch the total circuit that you have constructed, making the wires run horizontally and vertically on the page. This is more standard in terms of drawing electrical circuits. ➁ Reverse the two wires at the light. Does this have any effect on the operation? Reverse the two wires at the cell. Does this have any effect on the operation? ➂ In the following steps, use the pushbutton switch as shown on the right. ➃ Use additional wires as needed to connect a second light into the circuit in such a way that it is also lighted. (Use the switch to turn the power on and off once the complete wiring has been achieved.) Discuss your plans with your lab partner before you begin. Once you have achieved success, sketch the connec- tions that you made in the form of a circuit diagram. Annotate your circuit diagram by making appropriate notes to the side indicating what happened with that particular circuit. If you experience lack of success, keep trying. ➤ NOTE: Is your original light the same brightness, or was it brighter or dimmer that it was during step 1? Can you explain any differences in the brightness, or the fact that it is the same? If not, don’t be too surprised, as this will be the subject of future study. ➄ If you can devise another way of connecting two lights into the same circuit, try it out. Sketch the circuit diagram when finished and note the relative brightness. Compare your brightness with what you achieved with a single light by itself. ➅ Disconnect the wires and return them to the plastic bag. Replace the equipment to its storage case. The purpose of this lab is to determine how light bulbs behave in different circuit arrangements. Different ways of connecting two batteries will also be investigated. ➤ NOTE: Due to variations from bulb to bulb, the brightness of one bulb may be substantially different from the brightness of another bulb in “identical” situations. ➁ Use additional wires as needed to connect a second light into the circuit in such a way that it is also lighted. Discuss your plans with your lab partner before you begin. Once you have achieved success, sketch the connections that you made in the form of a circuit diagram using standard symbols. Annotate your circuit diagram by making appropriate notes to the side indicating what happened with that particular circuit. ➤ NOTE: Is your original light the same brightness, or was it brighter or dimmer than it was during step 1? Can you explain any differences in the brightness, or why it is the same? ➂ If one of the light bulbs is unscrewed, does the other bulb go out or does it stay on? Why or why not? ➃ Design a circuit that will allow you to light all three lights, with each one being equally bright. Draw the circuit diagram once you have been successful. If you could characterize the circuit as being a series or parallel circuit, which would it be? What happens if you unscrew one of the bulbs? Explain. ➄ Design another circuit which will also light all three bulbs, but with the bulbs all being equally bright, even though they may be brighter or dimmer than in step 4. Try it. When you are successful, draw the circuit diagram. What happens if you unscrew one of the bulbs? Explain. ➅ Devise a circuit which will light two bulbs at the same intensity, but the third at a different intensity. Try it. When successful, draw the circuit diagram. What happens if you unscrew one of the bulbs? Explain. 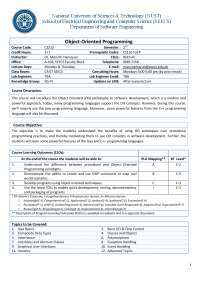 ➤ NOTE: Are there any generalizations that you can state about different connections to a set of lights? ➆ Connect a single D-cell to a single light as in step 1, using a spring clip “switch” to allow you to easily turn the current on and off. Note the brightness of the light. ⑧ Now connect the second D-cell into the circuit as shown in Figure 2.1a. 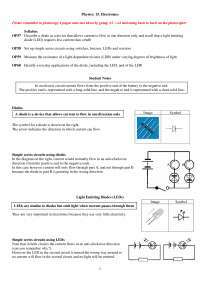 What is the effect on the brightness of the light? ⑨ Connect the second D-cell as in Figure 2.1b. What is the effect on the brightness? ➉ Finally, connect the second D-cell as in figure 2.1c. What is the effect on the brightness? ➤ NOTE: Determine the nature of the connections between the D-cells you made in steps 8-10. Which of these was most useful in making the light brighter? Which was least useful? Can you determine a reason why each behaved as it did? ➀ Answer the questions which appear during the experiment procedure. Pay particular attention to the “NOTED:” questions. ➁ What are the apparent rules for the operation of lights in series? In parallel? ➂ What are the apparent rules for the operation of batteries in series? In parallel? ➃ What is one function of a potentiometer in a circuit? The purpose of this lab will be to investigate the three variables involved in a mathematical relationship known as Ohm’s Law. ➀ Choose one of the resistors that you have been given. Using the chart on the next page, decode the resistance value and record that value in the first column of Table 3.1. ➁ MEASURING CURRENT: Construct the circuit shown in Figure 3.1a by pressing the leads of the resistor into two of the springs in the Experimental Section on the Circuits Experiment Board. ➂ Set the Multimeter to the 200 mA range, noting any special connections needed for measuring current. Connect the circuit and read the current that is flowing through the resistor. Record this value in the second column of Table 3.1. ➃ Remove the resistor and choose another. Record its resistance value in Table 3.1 then measure and record the current as in steps 2 and 3. Continue this process until you have completed all of the resistors you have been given. As you have more than one resistor with the same value, keep them in order as you will use them again in the next steps. ➄ MEASURING VOLTAGE: Disconnect the Multimeter and connect a wire from the positive lead (spring) of the battery directly to the first resistor you used as shown in Figure 3.1b. Change the Multimeter to the 2 VDC scale and connect the leads as shown also in Figure 3.1b. Measure the voltage across the resistor and record it in Table 3.1. ➅ Remove the resistor and choose the next one you used. Record its voltage in Table 3.1 as in step 5. Continue this process until you have completed all of the resistors. ➀ Construct a graph of Current (vertical axis) vs Resistance. ➁ For each of your sets of data, calculate the ratio of Voltage/Resistance. Compare the values you calculate with the measured values of the current. ➀ From your graph, what is the mathematical relationship between Current and Resistance? ➁ Ohm’s Law states that current is given by the ratio of voltage/resistance. Does your data concur with this? ➂ What were possible sources of experimental error in this lab? Would you expect each to make your results larger or to make them smaller? The purpose of this lab is to begin experimenting with the variables that contribute to the opera- tion of an electrical circuit. This is the first of a three connected labs. ➀ Choose three resistors of the same value. Enter those sets of colors in Table 4.1 below. We will refer to one as #1, another as #2 and the third as #3. ➂ Use the Multimeter to measure the resistance of each of your three resistors. Enter these values in Table 4.1. ➃ Determine the percentage experimental error of each resistance value and enter it in the appropri- ate column. Experimental Error = [(|Measured - Coded|) / Coded ] x 100%. ➄ Now connect the three resistors into the SERIES CIRCUIT, figure 4.1, using the spring clips on the Circuits Experiment Board to hold the leads of the resistors together without bending them. Measure the resistances of the combinations as indicated on the diagram by connecting the leads of the Multimeter between the points at the ends of the arrows. ➅ Construct a PARALLEL CIRCUIT, first using combinations of two of the resistors, and then using all three. Measure and record your values for these circuits. ➆ Connect the COMBINATION CIRCUIT below and measure the various combinations of resistance. Do these follow the rules as you discovered them before? ⑧ Choose three resistors having different values. Repeat steps 1 through 7 as above, recording your data in the spaces on the next page. Note we have called these resistors A, B and C.
➀ How does the % error compare to the coded tolerance for your resistors? ➁ What is the apparent rule for combining equal resistances in series circuits? 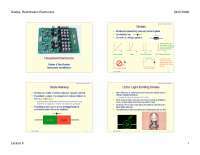 In parallel circuits? Cite evidence from your data to support your conclusions. 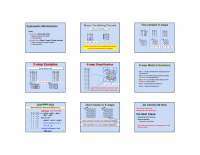 ➂ What is the apparent rule for combining unequal resistances in series circuits? 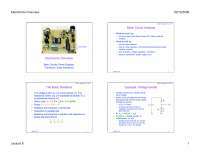 In parallel circuits? Cite evidence from your data to support your conclusions. ➃ What is the apparent rule for the total resistance when resistors are added up in series? In parallel? Cite evidence from your data to support your conclusions. Using the same resistance values as you used before plus any wires needed to help build the circuit, design and test the resistance values for another combination of three resistors. As instructed, build circuits with four and five resistors, testing the basic concepts you discov- ered in this lab. The purpose of this lab will be to continue experimenting with the variables that contribute to the operation of an electrical circuit. You should have completed Experiment 4 before working on this lab. ➀ Connect the three equal resistors that you used in Experiment 4 into the series circuit shown below, using the springs to hold the leads of the resistors together without bending them. Con- nect two wires to the D-cell, carefully noting which wire is connected to the negative and which is connected to the positive. ➁ Now use the voltage function on the Multimeter to measure the voltages across the individual resistors and then across the combinations of resistors. Be careful to observe the polarity of the leads (red is +, black is -). Record your readings below. ➂ Now connect the parallel circuit below, using all three resistors. Measure the voltage across each of the resistors and the combination, taking care with the polarity as before. ➤ NOTE: Keep all three resistors connected throughout the time you are making your measurements. Write down your values as indicated below. ➃ Now connect the circuit below and measure the voltages. You can use the resistance read- ings you took in Experiment 4 for this step. ➄ Use the three unequal resistors that you used in Experiment 4 to construct the circuits shown below. Make the same voltage measurements that you were asked to make before in steps 1 to 4. Use the same resistors for A, B and C that you used in Experiment 4. On the basis of the data you recorded on the table with Figure 5.1, what is the pattern for how voltage gets distributed in a series circuit with equal resistances? According to the data you recorded with Figure 5.4, what is the pattern for how voltage gets distributed in a series circuit with unequal resistances? Is there any relationship between the size of the resistance and the size of the resulting voltage? Utilizing the data from Figure 5.2, what is the pattern for how voltage distributes itself in a parallel circuit for equal resistances? Based on the data from Figure 5.5, what is the pattern for how voltage distributes itself in a parallel circuit for unequal resistances? Is there any relationship between the size of the resistance and the size of the resulting voltage? Do the voltages in your combination circuits (see Figures 5.3 and 5.6) follow the same rules as they did in your circuits which were purely series or parallel? If not, state the rules you see in operation. The purpose of this lab will be to continue experimenting with the variables that contribute to the operation of electrical circuits. ➀ Connect the same three resistors that you used in Experiments 3 and 4 into the series circuit shown below, using the springs to hold the leads of the resistors together without bending them. Connect two wires to the D-cell, and carefully note which lead is negative and which is positive. o . See Figure 6.2. ➂ Now move the DMM to the positions indicated in Figure 6.3, each time interrupting the circuit, and carefully measuring the current in each one. Complete the table on the top of the back page. ➤ NOTE: You will be carrying values from Experiments 3 and 4 into the table on the back. of the parallel circuit and measure the individual branch currents. Record your measurements in the table below. On the basis of your first set of data, what is the pattern for how current behaves in a series circuit? At this point you should be able to summarize the behavior of all three quantities - resistance, voltage and current - in series circuits. 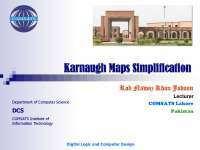 On the basis of your second set of data, are there any patterns to the way that currents behave in a parallel circuit? At this time you should be able to write the general characteristics of currents, voltages and resistances in parallel circuits. The purpose of this lab will be to experimentally demonstrate Kirchhoff’s Rules for electri- cal circuits. ➀ Connect the circuit shown in Figure 7.1a using any of the resistors you have except the 10 Ω one. Use Figure 7.1b as a reference along with 7.1a as you record your data. Record the resistance values in the table below. With no current flowing (the battery disconnected), mea- sure the total resistance of the circuit between points A and B. ➁ With the circuit connected to the battery and the current flowing, measure the voltage across each of the resistors and record the values in the table below. On the circuit diagram in Figure 7.1b, indicate which side of each of the resistors is positive relative to the other end by placing a “+” at that end. DLD and Pakistan Studies Notes.